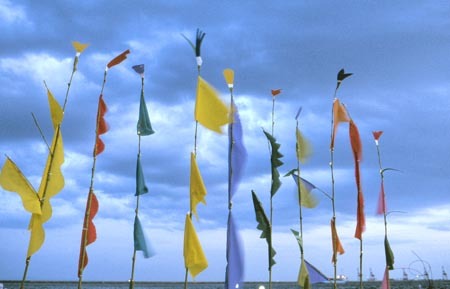 This outdoor exhibition displays artwork that can endure the sunshine and sea breeze for the month of August. This year's theme was "use solar energy", which each artist interpreted and then created their own art with cooperation from a company that develops solar batteries. My art above has LEDs in the bamboo flagpole and it lights up in the evening and looks like the glow of a firefly.